Oxford, ME – Through six months and 13 grueling races, the Amsoil Nelcar Legends Tour has had another extraordinary season. With many big headlines throughout the year and great battles for the victory, it all came down to one final showdown at Oxford Plains Speedway, it one of the most dramatic fashions. 13 points separated defending champion Matt Bourgoine and third year driver Ryan Hammar for the title. However, it wouldn’t be easy if Bourgoine wanted to defend his championship, as he would have to start at the rear of the field after a runner up finish in the last race at Wiscasset Speedway. Those two weren’t the only ones with something to fight for though, as 23 Legends Cars made their way to the track, a great field this late in the season. The two heat races were fairly clean. In the first heat, Ryan Hammar took the win over the 399 of Bob Weymouth and the 70 of Tylar Braunschweig. In the second heat, the only issue came halfway through the race when Oxford Plains Speedway regular Zachary Bowie had a motor let go. After the restart, it was clean and green, giving Ed Getty in the 10 car the win with Reid Lanpher in second and Matt Bourgoine in third. This gave Hammar four points going into the feature race, leaving the gap at just nine points. Hammar started on the pole with Getty on his outside for the 30 lap feature event. The 2 machine got the jump on the start, with Getty struggling on the outside allowing for Weymouth and Braunschweig to fall in line behind Hammar. Hammar drove away with the early lead, but coming from the fourth spot was the 59 of Reid Lanpher looking to make a charge for the lead. On lap six, Wyatt Alexander went for a spin after making up a lot of ground from his starting spot near the rear of the field, and was collected by the 19 of Kevin Girard Jr. Dan Winter and Pete Cannell were also involved in the incident, ending Girard and Winter’s days early. On the restart, Lanpher was able to make his way by Hammar, and grab the race lead. Those two battled hard before the next caution came out on lap 11 as the 25 of Larry Poirier went for a spin in turn three, ending his day early. Lanpher lead the charge on the next restart, and opened up a good sized lead over new runner up John Peters in the 88, who had started from the rear of the field. On lap 19 however, Reid Lanpher’s motor blew and went up in a ball of flame down the backstretch, ending a great run early for the young driver. With just ten laps to go, John Peters found himself in the lead with Hammar on his outside. Peters got the jump on the restart, and Bourgoine went with him to grab the second spot. The two title contenders battled amongst themselves as Peters opened up his lead. 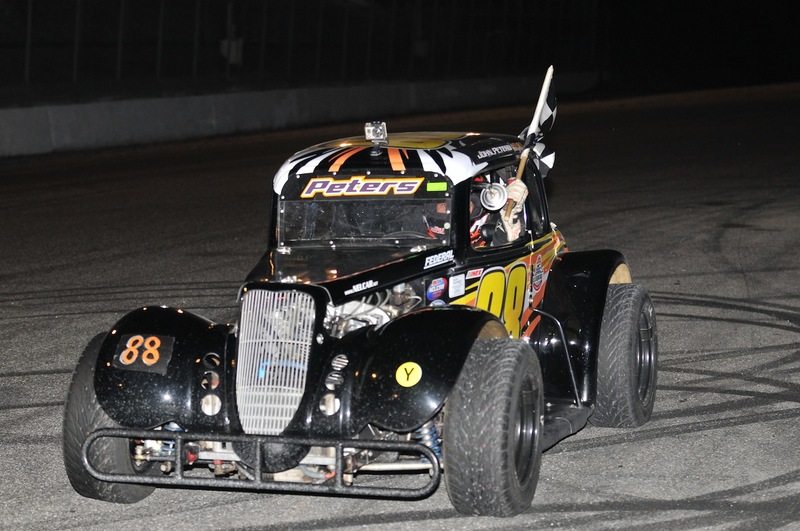 At the finish, it was all John Peters at the checkered flag, grabbing his third Tour win of his rookie campaign. Ryan Hammar finished second with Matt Bourgoine right behind in third. Tylar Braunschweig had another strong run at Oxford in fourth with Bob Weymouth rounding out the top five. With his third place finish, Matt Bourgoine grabbed his second consecutive Amsoil Nelcar Legends Tour championship! Ryan Hammar finished just six points behind in what was one of the most exciting season long battles for the championship in a long time. The Tour may be done points racing, but it’s not finished with the season just yet. Next week the Tour will be in action for an exhibition race for INEX National Points at Wiscasset Speedway. Racing will start at noon and tickets are just $5.